This city fellow was driving down through the mountains when he got lost. He saw a farmer standing near the road behind his pasture fence. He stopped his car and asked, "How far to Knoxville?" "Don't know." "Well, how far is it to Chattanooga?" "Don't know." "You don't know much, do you?" "Well, I ain't lost." This angered the city man, and he said, "There isn't much between you and a fool, is there?" "No, sir, just a fence," the farmer said. 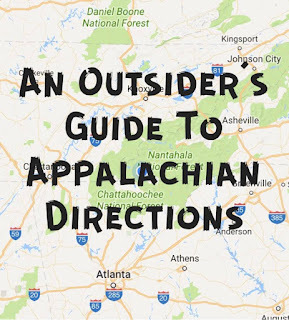 Before I even begin to explain how directions are given in my area of Appalachia, let me say that these may apply to other parts of the country (specifically the south) and may not apply to other parts of Appalachia (specifically the north). I'm going to explain how it is done in MY neck of the woods, western North Carolina. 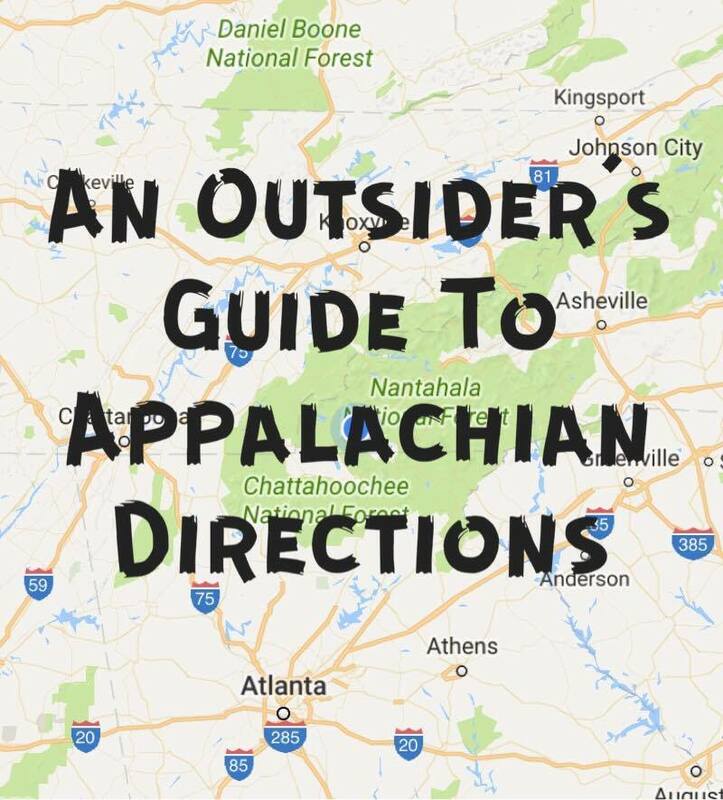 There are countless back country roads throughout the many rural areas that make up Appalachia. Many of the roads aren't even marked which can render your GPS completely useless. Think you can do a Google search to find out where you are and to help you get where you're wanting to go? Don't count on it. Cell phone service isn't always available in these areas. So what's a person to do??? Something that most men have avoided since the beginning of time. ASK FOR DIRECTIONS. "Well, how are y'all a doing? That's good. Where are y'all from? Miami? Gracious, y'all are a good ways from home, ain't ya? Oh sure, I can help you get to where you're aiming to go. You have people in these parts or are y'all just out loafering?" After a little small talk, you'll soon find out that people around here don't bother giving road names or numbers. We prefer something a little more colorful...like landmarks. So instead of simply telling you to turn left on Main Street and go 15 miles until you reach Walnut Lane, you'll hear: "Alright, you're going to go back out the way you came in but this time you're going to take a left at that pretty little Missionary Baptist Church. You know, my momma and daddy were married at that church back in '67. It's the truth! They'll be celebrating their 50th anniversary in June. Folks just don't stay together like the used to, do they? Now when you get to the fork in the road where that chicken truck turned over, you're going to want to go right. It'll seem like you're just going straight but you're really going right." I should also let you know that we use certain directional phrases to explain how far you need to go. Down the road a piece. Translation: About a mile or two. Just a hop, skip, and jump. Translation: About 15-30 minutes. A little ways. Translation: Usually less than 5 miles. Just up the road. Translation: Less than a mile. Over yonder. Translation: Sorry, this could mean anywhere from 5 feet away to the next county over. Now that you can somewhat translate our directional phrases, be prepared for a little more friendly conversation. It may take a little while but we will almost always get you where you're wanting to go. The best advice I can give an "outsider" would be to simply slow down and don't be rude or try to rush whomever is taking the time to help you. People from these parts will not be disrespected or rushed. You've been warned. I hope you'll find these tips helpful if you ever decide to visit the beautiful area that I call home. You won't regret it!